The SEMA Memorial Scholarship offers dozens of awards ranging from $2,000 to $3,000, with a $5,000 award going to the top student. Scholarship applications for the 2017 SEMA Memorial Scholarship Fund are due March 1. The SEMA Memorial Scholarship program offers financial assistance of up to $5,000 to help foster the next generation of automotive aftermarket industry leaders and innovators. 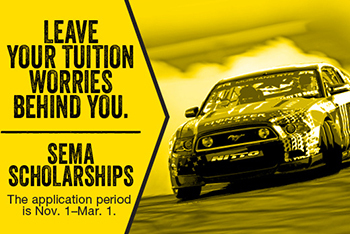 Students can apply for the scholarship at www.sema.org/scholarships. Scholarships are available in a variety of categories, such as accounting, sales and marketing, and engineering. Dozens of awards ranging from $2,000 to $3,000 will be given out, with a $5,000 award going to the top student. The program also includes a loan forgiveness aspect that offers financial awards to employees of SEMA-member companies who have completed and are paying off a loan for a program of study at an accredited university, college or vocational/technical program within the United States. For more information about the program, please contact Juliet Marshall, SEMA manager of education projects, at 909-978-6655 or julietm@sema.org.